How was the holiday at your end? Hope you slept as much as you planned to and you spent time doing all what you planned to do well? So,this isn't the kind of post where I abstractly talk about being yourself,being original and all. I know you've read more than enough on that. This is a really personal post where I'd be sharing times when I went off track with my originality and I paid dearly for it. It's amazing how the many things we laugh at ourselves over are the ones that teach us some of our greatest lessons. Cooking Style: Okay,this one is hilarious and just don't laugh at me too much. A random fact about me is that I hate spicy food. This day in the hostel,a friend prepared noodles for both of us and it had this cool,different look (I don't add anything to my mine) so I just figured out it was pepper because of the hot,spicy taste plus it had a really attractive colour. Few days later,noodles once again was the order of the day for me and I wanted to prepare it like my friend did with the colour and all so I added pepper. The colour did not change and I kept adding and adding till it was done. I totally forgot about my hatred for peppery foods an dmy friend wasn't around so I couldn't ask what the secret ingredient was. Long story cut short,the food was insanely peppery, keyword- insanely. As you might have guessed,I poured the food away. It wasn't even funny that day because I kept asking myself who sent me work and why didn't I just do my own thing,eat and forget about it. Such wastage because of copy copy. Wastage of resources. Hairstyle: So it was close to exam period and I needed to do someting to my hair. I had this weave I got from my sister so I decided to fix it. Instead of me to go for my normal fixing style just for exams' sake and save experimenting for later, I didn't . I went for this particular style I thought looked nice, a decision I came to hate. I was always too tired to brush the hair,it was something serious guys. I'd be starving and the required step to take is to go get something to eat but the thought of combing my hair would instantly tire so I'd just stay put. It was literally choking me and one day when hunger wanted to kill me, I finally loosened it (a week or two after). Such wastage because of copy copy. Wastage of time. Wastage of money! Night Vigil: Most painful of all. This happened twice actually; both in my first year but I'd be sharing just one. Writing this just gets me amazed and pleased at how much growth I've gone through since then. It was my birhday eve and my friend and everyone of my christain roommate was going for this vigil. I wasn't interested because I wasn't just interested LOL plus I had a meeting in church the very next day (Yes,my birthday) and I intended to go. And then night came, I thought about how bored I'd be alone so I tagged along as you might have guessed. I have a lot to say about how the programme went but I'd just assume you already figured that out plus it's not a very good thing to talk about on here. All I'd say is don't ever go for something like this because you're bored or because someone says you should. I invite people for programmes and when they don't come,I don't start going all defensive on them because my own experience has made me know better than that. Don't ever go anywhere just for going sake. You see how I wasted my time,energy and forfeited my sleep? Don't be like me. My dear brethren,this is the conclusion of the whole matter : Staying true to who you are saves you a whole lot of stress in every area. See the interesting ways I learnt my own lesson? Above all aim to be better at all these. Have you ever gone off track with your originality? What lessons did you learn? Nice write-up, I've always learnt that you can't be like anyone from experiences. You are very right. Nothing like being your true self ALL the time. Trying to imitate people will surely bounce back at you in a way you 'd regret at the end. If i say am not doing this, even when everyone is doing it or going somewhere, nothing would move me. Highest i would do is to SLEEEEEEEP and wait for their return. Lol! This reminds me of reading style. I could never pull an all nighter no matter how hard I tried. Some days I tried, I just ended up sleeping all through. It's important to indeed know what works for you and stay true to it! So true! Being yourself is very important, no matter how hard you try, you can never be someone else.Be you. Changing your style just to please others can put you in a very depressed state. It helps to be uniquely you as long as being you doesn't mean deliberately hurting others. Thanks for the reminder to stay original. It's amazing the amount of agony that we can cause ourselves simply because of ‘copy copy’. Hehehe!! Sorry about the pepper oo. I had a similar hairstyle wannabe moment in my final year and I still regret till tomorrow coz it killed my edges. Sad. I love to read a lot and this one time, I decided to buy some inspirational books but blehhh, it wasn't werking! I then realized that I was trying to copy someone else's reading style instead of just moving on with my own flow. 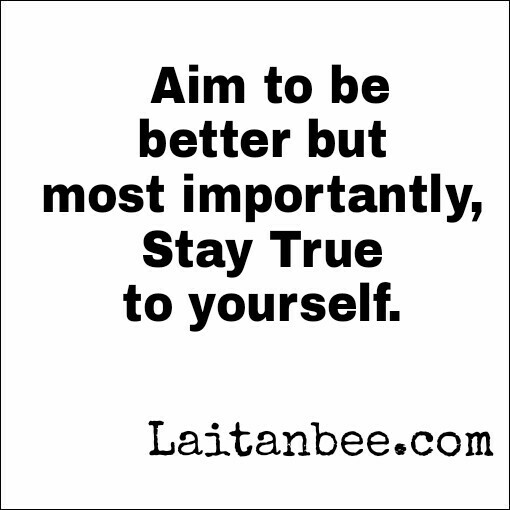 Staying true to oneself is the best thing that anyone can ever do for themselves. Thanks for sharing this. Staying true to your self is key. That noodles one got me laughing. Funny but true. Nothing better than being yourself and loving it. Great post! My weekend was rehearsal filled didn't sleep as much as i wanted!oh my goodness I also had a similar experience with indomie. we do need to just love ourselves the way we are! I enjoyed reading this. I couldn't stop laughing. It's great to stay true to yourself but don't get too comfortable in your comfort zone. My friends always say I'm not a risk taker coz I never entirely risk anything. Like when I did my big chop, I made it long enough to braid and fix so if it turns out ridiculous I'd still be "safe"
of a risk taker too. Cnclusively, (lol like i wrote the post) your originality is what makes you you, its what makes people love and admire you. You can never be a better version of someone else. So like you said stay true to yourself. copy copy will always put you in wahala one way or the other. Hey I nominated you for the sunshine blogger award! Details on my blog. You hit the bullseye! Nice one dear,some people never really realize the fulfilment of their dreams because they always copy. Don't even immitate successful people,what worked for them may not work for another. its better when one learn from them. Being oneself is the best. Remember Oscar Wilde once said "Be yourself; everyone else is already taken" So Olaitan don't be like me, am already taken! Lol. You are right, it's very important to stay true to yourself. We are running diffferent race. Haha, I can totally relate. Who copy copy don epp.